‘Let Spin’ – guitarist Moss Freed (Moss Project), bassist Ruth Goller (Acoustic Ladyland, Bojan Z), saxophonist Chris Williams (Led Bib) and Fin Panter (Beats & Pieces) on drums – is a musical collaboration which features original compositions from all four members, from dark, brooding grooves to upbeat quirky riffs via folk-infused melodies and free playing. Each member is individually causing a stir in their various projects and this coming together promises to be an electric meeting of their creative forces. The Nick Malcolm Quartet play original music on the frontier of structure and free improvisation. Featuring four highly individual improvisers – Nick Malcolm (trumpet), Alexander Hawkins (piano), Olie Brice (bass) and Mark Whitlam (drums) – who create beauty and surprise by allowing the music to go anywhere. Rhythmic cycles, timbral dimensions and melody are merged and deconstructed in unexpected ways, resulting in interactive, intense and thrilling performances. From France – quintet of stirring music, elegant and poised jazz to punk to groove to bolero. Fom Italy – progressive avant-punk jazz trio combining explosive energy, punk angularity with highly improvised music. Led by drummer Mark Holub, from the UK Led Bib are the sonic equivalent of a volcanic eruption backed by a fire storm. From Poland – aggressive drum ‘n’ bass mixed with complex African rhythms. From Ireland – two-horns-no-chords quartet led by drummer Matt Jacobson. Downtown grooves with catchy melodies and collective improvs and an influential dose of Carnatic music of Southern India. Eighteen musicians assembled from all the bands. From the UK – keyboardist Dave Morecroft leads “serious scronk jazz WSP crew through irreverent blend of face-slapping funk, odd metered grooves and a clutch of catchy, zigzagging melodies all to dazzling effect” (Time Out). From the UK – redefining preconceptions of contemporary British jazz to voracious crowds of old-proggers and muso-teens – virtuosity with mind-blowing coherence. Pyscho jazz, stepping a fine balance between structured composition and free improvisation, syncopated and pressing rhythms. Ahead of the curve Nordic jazz with a nod to British prog rock. From Italy – electro-dirty-progressive- funk on a psycho-surreal mission to rid the cosmos of evil, armed solely with synth, bass and drums. Now in its 21st year the U.K’s longest running free improvisation series presents an eclectic and engaging evening with some of the best musicians playing today. Trumpeter Chris Burn and pianist Hutchinson’s eclectic musical backgrounds are, jazz and 20th century music, and blues and jazz (experimental), respectively. Over the years they have performed individually in many improvising environments; first coming together in Burn’s much lauded ‘Ensemble’ and later as this duo. Both use techniques that are often far from conventional, resulting in personal and individual approaches to their instruments. From this, their music can range from the microscopic to the orchestral. Last year’s appearance from Mark Browne’s trio was thoroughly enjoyed by all who were lucky enough to be there and we are delighted to see him back once more, (playing castrato saxophone / percussion), with the extraordinary Sonic Pleasure (bricks / masonry / metal) and the masterful trumpet work of Ian Smith, in what promises to be a vital mix of aural delights. First playing together in 1974, pianist Steve Beresford and guitarist John Russell are highly respected, both here and abroad, for their improvisational skills, individually playing with some of the world’s leading players in a wide variety of circumstances. Having worked together in a number of groups, duo appearances can probably be counted on one hand. We have tried to programme this before but diary clashes prevented it. A rare opportunity to witness two inventive and enquiring musicians. Unmissable! 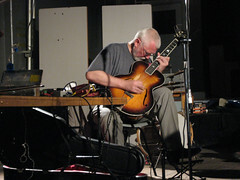 Evan Parker‘s monthly free improvisation residency with bassist John Edwards and guitarist John Russell. For 20 years Mark Sanders (drums) and John Edwards (bass) have been a leading ryhthm section, appearing live internationally and on cds with a/o Evan Parker, Agusti Fernandez and Veryan Weston. Trumpeter Nate Wooley has been gathering international acclaim for his idiosyncratic approach – Dave Douglas has said of him, “Nate is one of the most interesting and unusual trumpet players living today – and that is without hyperbole”. Trombonist Sam Kulik is about to dive into a 9-show NYC run of the “disco-jazz-rock opera” Talibam! and Sam Kulik Discover AtlantASS,” just released an accompanying CD and 30-page comic book for that work, is celebrating yesterday’s release of Starring’s new album on the Brooklyn-based Northern Spy label (Spin gives it 8/10 and praises the group’s “gloriously skewed neo-classical noise prog”) and is also preparing for the release of his own album, Escape from Society, in just a few short weeks. Sam cites Frank Zappa as his primary influence – it doesn’t take long to get a sense of what he’s all about creatively – read on to learn about what he’s been up to (including brewing his own kombucha! ).